Fried Spring Rolls - The best and crispiest spring roll recipe ever, filled with vegetables and deep-fried to golden perfection. 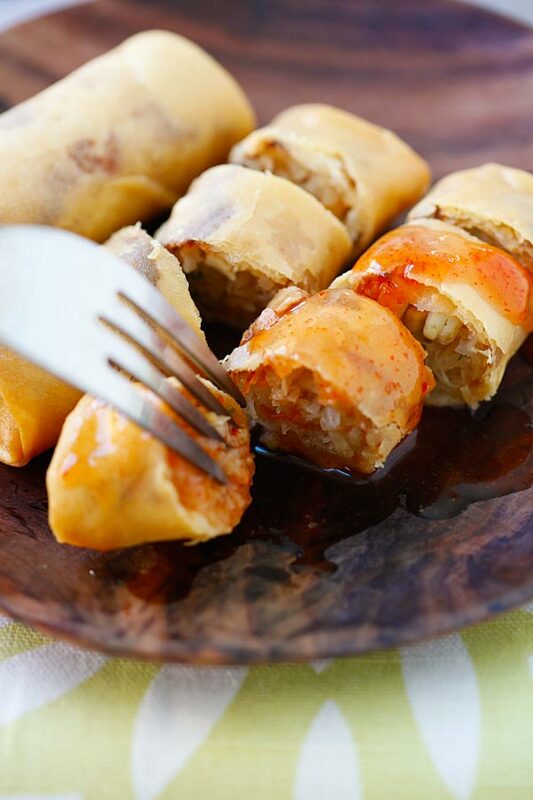 The Chinese Straits like their popiah or spring rolls wet with savory fillings of julienned jicama, diced bean curd (firm tofu), shrimp, and crab meat wrapped in a fresh spring roll wrapper coated with sweet sauce (tee cheow) and chili paste. The Mamak (Indian-Muslim) prefer sweet date sauce in their spring rolls and less ingredients. They also like their popiah (spring rolls) deep fried to perfection and served with spicy hot sauce. 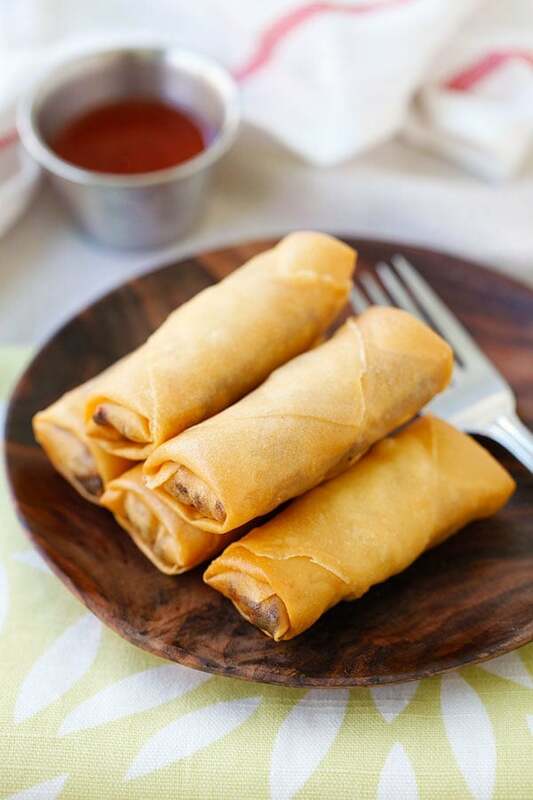 In the Philippines, spring rolls are called lumpia and come in smaller packages; while in Vietnam, Cha Gio (Vietnamese spring rolls) are filled with ground pork and cellophane noodles instead of vegetables. Are Spring Roll and Egg Roll Wrappers the Same? 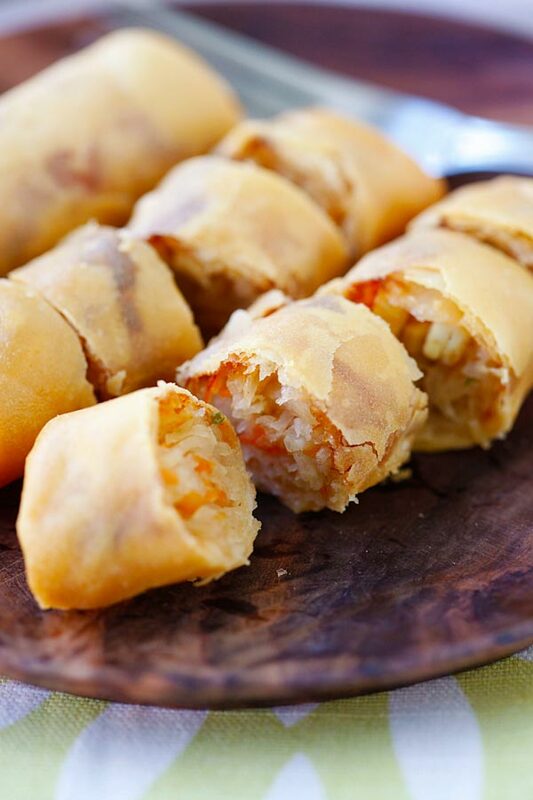 Then, there is the popular egg roll—a common appetizer in American Chinese restaurants—made with a thick spring roll (egg roll) wrapper and packed with shredded cabbage and served with sweet and sour sauce. Egg roll wrappers are a lot thicker and have various layerings, while spring roll wrappers are thinner and have a specific layering. Regardless of its size, recipe, and method of preparation, spring rolls are tremendously popular. Try making spring rolls on one of your weekends or whenever you want to indulge in the joy of cooking. Suffice it to say, spring rolls are absolutely worth devouring. And let your maid or significant other handle the unpleasant chores. This is my recipe of fried spring rolls, a Malaysian version of spring rolls. Enjoy! Pan-fry the diced bean curd with a little oil until they turn light brown. Set aside. Heat oil in a wok and stir fry the garlic until aromatic. Add shrimp, julienned jicama, carrot and long beans. Season with salt, sugar, pepper, and cook for 5 minutes. To assemble the spring rolls, lay a spring roll wrapper on a clean cutting board. Put some filling in the middle and add some diced bean curd on top of the filling. Fold in the two sides and roll up the wrapper tightly to form the spring rolls. Seal the spring roll with the sealing paste and deep dry them over medium heat until golden brown. Drain the spring rolls on paper towels and serve them with chili sauce. For the chili dipping sauce, I recommend Lingham's hot sauce if you can find it, or Sriracha hot chili sauce, or Thai sweet chili sauce. If you can't find jicama in your market, you can use cabbage. Nice touch of a single green long bean dice in the pictures. I am having spring rolls now….Yummy.. Your photos and food always look so beautiful. I thought I’d share a Chinese eggroll frying technique that I like to use which involves two woks, one heated to ~325 degrees Fahrenheit, the other to 450-475 degrees Fahrenheit. I fry the eggrolls in the lower temperature wok until they’re almost done, then transfer them directly to the hotter oil, blasting them with heat to crisp the skins and seal in the flavor. The result is eggrolls that aren’t greasy and resist getting soggy for hours. My gramma taught it to me. Wow, now I really feel like having a springroll for brekkie or firing up the wok to make some. TehSee – Welcome to Rasa Malaysia and thanks for leaving me a comment. I will definitely try out your frying tips in the future. Yep, my spring rolls turned soggy after while. Another way that my aunt taught me is to dip the spring rolls into a rice flour batter– and that would seal in the crispiness too. Boo – yes do cook and I can’t wait to see your cooking posts. although i know poh piah taste nice but i don’t like them and rarely eats them… esp. the wet type. fried type once in a while, yes. ah but if the poh piah is fill with prawns, i will eat it!! Impeccable shots Bee. And thanks for sharing the recipe. By the way, the part about letting the maid do the unpleasant chores is funny to me. We had a maid in Indonesia, just like everyone else. I sometimes wonder if the maids had maids of their own. Anyway, great post, as always. Is this an asian creation? You can also find the variations in central and south America. It’s also a staple in Northern American’s tapa restaurants. RM, this will go US$10 (at least) in NY. Great pics as always! And should I say what great maid or significant other you have. Irene – Thanks and welcome to Rasa Malaysia and thanks for leaving me a comment. Do pop in again. My favourite! (I have lots of favourite food! Ha Ha…) Love your pixs! Thanks for your compliment. Yes, they are my favorite too! 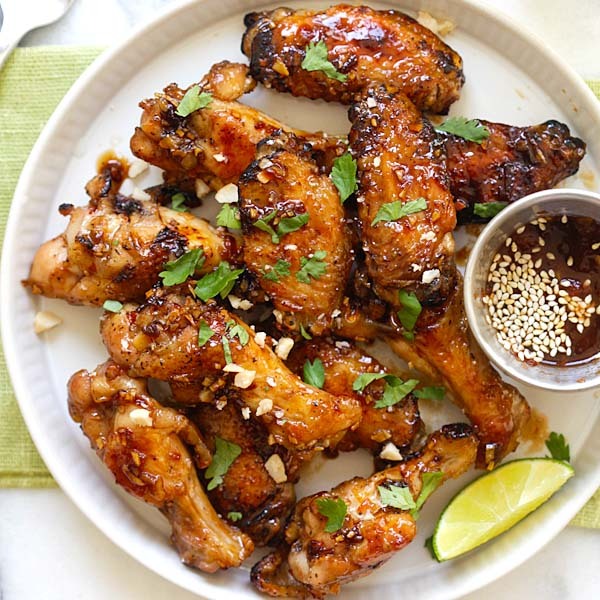 hey rasa malaysia…thanks for the great recipe! I love your food blog. It is wonderful. How do you manage to keep so slim. Do you not eat the food you prepared? I like your version of fried spring roll better than those sold at the chinese restaurants here. Im definitely going to try your recipe the next time i make them. Just want to let you know that I made this fried spring rolls using your recipe and they are so good. The best Spring Rolls I have ever eaten, were in Australia. NO 1 was Jimmy Wah (deceased) in Ipswich QLD and NO 2 was New Ah Sing Chinese restaurant in Sydney, sadly it’s closed down now. As far as I could tell from a consumers point of view, the Spring roll was a mixture of Pork mince, lots of shredded cabbage and some shredded Chicken, a little Grated Carrot and several Prawns. The Spring Rolls were moist and semi mushy inside highly likely from Chicken stock and very flavoursome. I have tried desperately to duplicate these, but I am still far off. The secret seems to be in the sauce mixes, the amount of Cabbage to Pork (at least 5 to 1) and cooking all of the ingrediants together, except the Prawns. I wonder if you have come across this recipe? hi, i have a family recipe which we use shredded cabbages,shredded carrot, bean sprouts, some dried shitake mushrooms and minced pork and prawns & spring onions. are much sweeter than most veg.. I too am searching for that recipe too. The Chinese shop at banjo had them but unfortunately they have closed down. There was definitely a sauce in it Let me know if you find it. When I lived in Japan, a lot of the Filipina wives would have lumpia parties where they all got together and made mounds and mounds of lumpia. They would divvy it up at the end of the party, sharing not just the laughs, but also the goods made that day. I know they froze most of the lumpia, but I don’t know at which stage they did that. 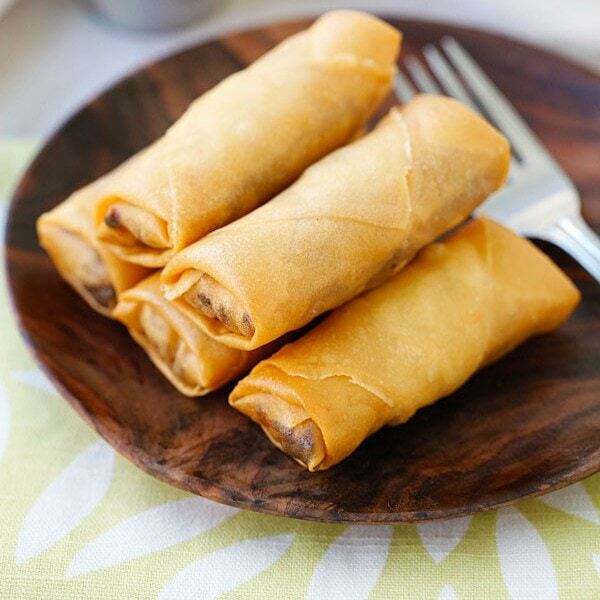 Do you know if we could freeze these spring rolls the way they did? If so, at what stage? I would guess after rolling (duh…), but before frying. Is that right? 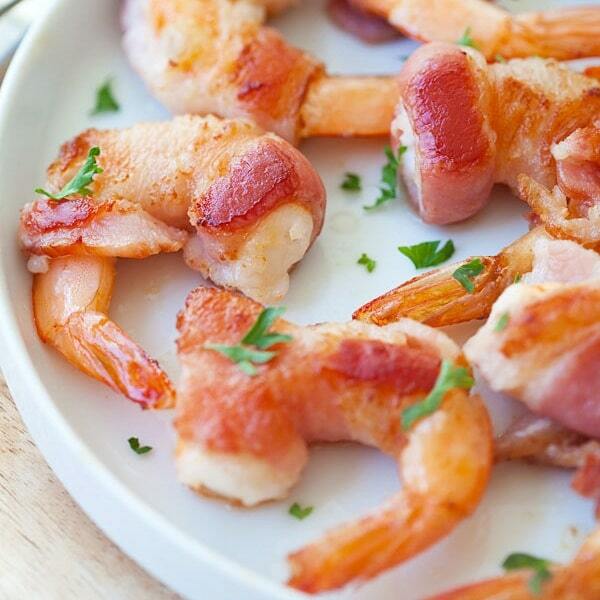 I want to make some and freeze them ahead of time, but not sure if once frozen they can go directly into the oil or if it needs to be thawed. My fear is, if I thaw them they will get soggy, but if I transfer them from the freezer to the hot oil they will explode or will cook too quickly on the outside while the inside is still frozen or cold. Any tips on how to cook frozen spring rolls? What is the size of the wrappers you’re using? In the 2nd photo is that the finally shredded jicama that looks like noodles in your spring roll? Yes, they are sliced into thin match sticks, or julienned. I have lived in Nanning for 2.5 years never have seen egg rolls or spring rolls here.. My Chinese wife has never seen egg-rolls or spring rolls either. She makes dumplings. I finally found someone who will cut the dumpling wrappers to egg roll size. Supermarkets and fresh air markets have no idea what I am asking for nor has my wife had any luck. Can I use the dumpling wrappers for egg rolls and is there some place or magic word word I can use to find the wraps for spring rolls or egg rolls? Even if it is in Mandarin the stalls and the markets recognize me and I often copy from Google Translate a Mandarin word for what I am looking for.and show them. Any other suggestions? What is jicama anyway? We dont see this in the supermarket any simpler recipe? Jicama is a root vegetable that you can find at Asian restaurants. You can use cabbage instead. Is there a way to bake the lumpia after it is all put together. I really don’t need the calories from frying but once I start eating them I can’t stop! You can bake but it’s not lumpia if they are not fried. 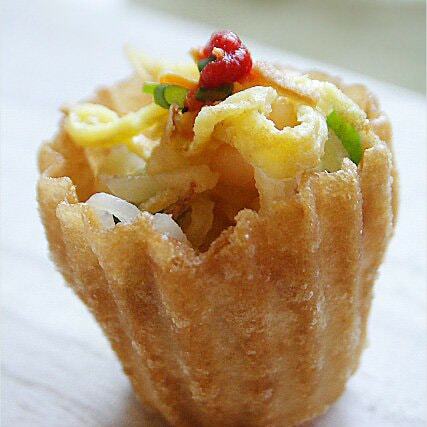 Your blog is very useful about making of Fried spring rolls. This is the best fried spring rolls recipe ever. Order your favorite sweets, savories, pickles and dry fruits many more. Get your order delivered to your doorstep anywhere in Hyderabad. Sounds great, will definitely try them, but most of all thanks for leaving cabbage out. I never eat spring rolls at Chinese restaurants, since they almost always are loaded with cabbage and are bland and tasteless. Yep, American spring rolls are just bad! Thank you for the recipe, Bee.